Note: We highly recommend using a PrintHub with Express Check-In. 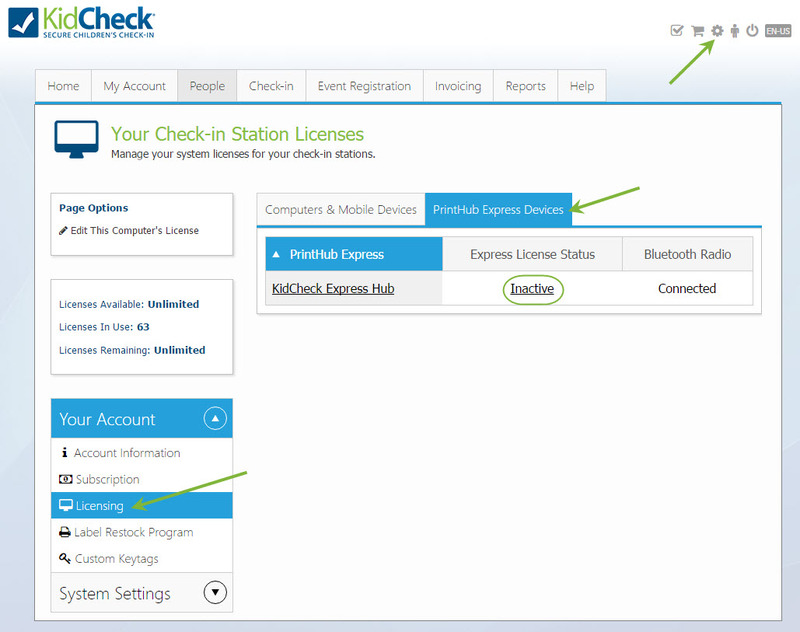 Before activating Express Check-in, you’ll want to make sure your account is set up for regular Check-In. To see how parents complete an Express Check-In, click here. Go to the Check-in tab > Express tab. Select “Add a Template” or “Add a Program” under Page Options on the left. On the window that opens, select the desired template/program. Once the template/program is added to your list, select the day(s) you want it available for Express Check-in. Enable a template/program for Express Check-in and activate it for any day(s) of the week. Select the green Save Changes button. After the KidCheck PrintHub is set up, log into the KidCheck app on your tablet (iPad/Android) or Android phone/iPhone. Go to the Check-in area > Licensing (on the left) > PrintHub Devices. Tap on the PrintHub you want to activate for Check-In. After the KidCheck PrintHub is set up, login to go.kidcheck.com. Go to the System Options gear (upper right) > Licensing on the left > the PrintHub Devices tab. Select the “Inactive” link under the Express License Status column (the link will change to Active). 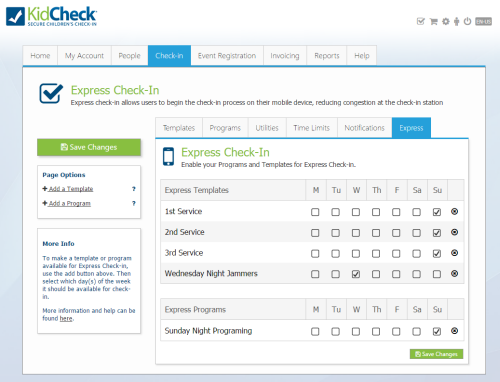 Add a template/program to your Express tab to allow parents to complete an Express Check-In from their iPhones.